Teen genius Kelly James is in a lot of hot water. A whiz with computers, she agreed to help her college rA, David, uncover some top-secret information. After all, she doesn’t have many friends and David has always been nice to her. it doesn’t hurt that he’s supercute and irresistible, too. All she has to do is hack into the government’s main computer system. but a few hours later, her whole life changes. she is caught and taken in for questioning, only this isn’t your run-of-the-mill arrest. rather than serve a juvenile detention sentence, she accepts the option to change her name and enlist in a secret government spy agency that trains teen agents to go undercover. As if that wasn’t overwhelming enough, she discovers that David works for this agency as well! And before she even begins to understand what is going on, she’s sent on her first mission as an undercover model. And who better to partner with than David himself! Shannon Greenland definitely tops my list of favorite authors! After falling in love with her latest young adult novel, The Summer My Life Began, and now having had the opportunity to read one of her earlier works, I am a fan for life. 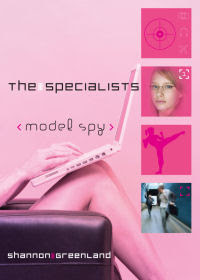 Model Spy is the first in The Specialists series, now available in ebook, and it's perfectly amazing! Kelly James is a teen genius, sixteen years old and already in college. While she exhibits all the symptoms of nerd, Kelly looks more like a model standing at 5'10 with a slim build. Even with her looks, it can't be denied that her skills are top notch and when she's working on computer codes she's in her zone. After getting busted for hacking into the government to find information on her friend, David's, missing father, Kelly is offered an opportunity she can't pass up. She's approached by Thomas Liba to join the Specialists. And so her new life of college, physical training and espionage begins. Kelly, affectionately nicknamed Gigi by her new team members, comes to the realization that she could possibly find a home at the San Belden Ranch. Even after she learns that David was sent to recruit her to the team, and that it'll be up to her to go undercover to help him rescue his father, Gigi decides to stay and lend a helping hand. Here's where the story gets even more interesting. Gigi is klutzy and not a social butterfly, so when her first mission is to go undercover as a model she starts to rethink the whole spy business. Her task will be dangerous and set with many obstacles, but you can be sure that Greenland keeps it intriguing! Who would have ever thought that modeling, computer hacking, and spying could go hand and hand so engagingly? I have to say that the second half of the novel, which is an explosion of action and heartfelt emotion, is only half of what makes Model Spy so fun. The multitude of characters and unique personalities makes for a very unpredictable story, but each one of the Specialists team members are endearing and unforgettable. Each has a specialty from linguistics to martial arts and they all have the opportunity to belong to a family. While making these characters stand out with humor, Greenland doesn't neglect to give us a reason to sympathize with them. Since Gigi is the central character, readers will especially focus on her growth and empowerment. Thankfully, Gigi's story continues with four following Specialist novels! Even if you read them when they were first published, now is the time to become reacquainted with Gigi and her friends. It's especially the perfect time to introduce readers to Shannon Greenland's believable storytelling! I love the cover! Your review has me intrigued. I might have to get this one.